Following the success of 2016 in Rotterdam, Tankwell, composite tank containers, will be present at the Intermodal Europe 2017 in Amsterdam. From 28 to 30 November 2017 the world-leading exhibition will be held for companies associated with the container and intermodal industries and covers all areas of container transport and logistics across road, rail and sea. Tankwell tanks are made of composite by a way of a high-tech winding production process, whilst the frame is made of conventional steel. The valves are supplied by well-known premium suppliers e.g. Fort Vale. Due to the use of composite, the total tare weight is up to 40% lower than tanks with the same specification made of stainless steel. This means that a 29.000 litre Tankwell swap body tank container has a tare weight of only 2.250 kg. Resulting in 5% to 10% reduction in freight costs. Moreover composite offers 40% better thermal insulation properties. The need for additional heating during transport or re-heating of the product prior to the customer delivery can be either reduced remarkably or even eradicated entirely. Both benefits also result in less CO2 emission and thus have a positive impact on the environment. 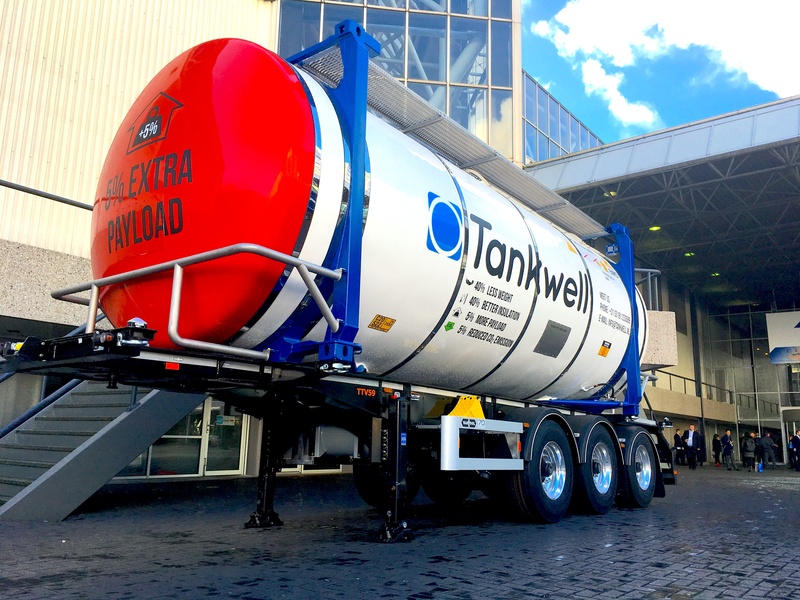 “So far more than 200 Tankwell tanks have been introduced successfully into the food and chemical logistics chains and mid July 2017 Tankwell has moved to larger premises in Holland to extend their production capacity and to improve the efficiency of the manufacturing process. Another step into the future to which we are looking forward with confidence”, concludes Tankwell.